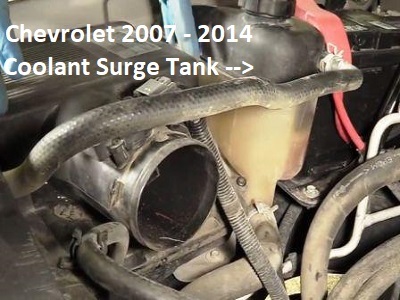 The Chevrolet radiator surge tank is one of those parts people call many different things. In the old days we called it an expansion tank, but referring to it as a coolant reservoir or the radiator overflow bottle also seems like valid nomenclature. No matter what you call your Chevrolet radiator surge tank, the chances of the original equipment part making it all the way through the lifespan of the truck remains small. This is especially true if you own a Chevrolet Silverado from the 2007 through 2014. The 2003 and older trucks have the same issue, but the reservoir looks different as shown below. 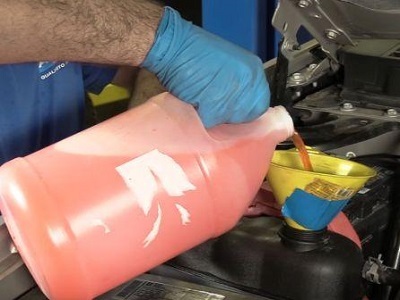 Of course, this coolant recovery tank problem also includes the GMC Sierra, Yukon and the Chevrolet sport-utility vehicles like the Tahoe and Suburban. Despite the radiator surge tank being made out of extremely thick plastic, chances are you'll find yourself replacing this at least once in the vehicles life span. In fact, we'll provide an argument of why maybe you should replace it before it actually cracks and starts leaking. With a cost less than $60 and the labor involved straightforward, it would appear that an ounce of prevention is worth more than a pound of cure in this situation. In this article we'll talk about why the Chevrolet radiator surge tank is failing on these specific models from 2007 - 2014. In addition, we'll talk about some of the important steps that can make this fairly easy job even less complicated. With that said, whenever we talk about working on a cooling system we're talking about a vehicle that is completely cooled down. Ideally, you'll walk out to the driveway after the vehicle sat overnight to perform these repairs. Unfortunately our busy schedules don't always allow for these perfect conditions. As a professional technician we have a few tricks to remove the heat from the engine and the cooling system so that you don't have to wait 24 hours to begin. Finally, we'll talk about what kind of antifreeze mix you want to add to these General Motors cooling systems. The obvious sign that you have a problem with the Chevy radiator surge tank is consistently low antifreeze levels in the reservoir itself. Remember that you check the level when the engine is cold at the cold fill line on the reservoir. Although there are a few common areas the overflow bottle leaks from, the lower hose connection often develops hairline cracks. Some of the symptoms that point towards this issue include a gurgling sound from the heating system located on the passenger side firewall. As the system becomes low, it pulls air into the Dex-Cool anti-freeze causing bubbles. This is what generates the surprisingly loud gurgling noises while you're driving. As the coolant level begins to fall even further drivers may experience lack of heat and then eventually an overheating situation from the engine. In some cases customers describe their first clue behind a Chevrolet radiator surge tank problem as drops of coolant in the driveway. 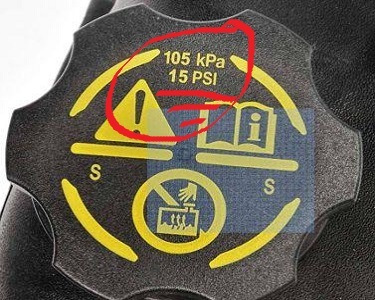 Update: If the new part comes with a 20 PSI radiator cap, reuse the original 15 PSI cap or get a new one. Before we begin repairs, the engine needs to be at ambient temperature. Mechanics have a trick for removing the heat quickly from an engine. With the hood open heat rises. We can accelerate this by placing fans blowing upwards through the engine compartment. With a couple high flow fans the engine can reach ambient temperature in as little time as an hour, depending on weather conditions. There are two, possibly three connections, to the Chevrolet radiator surge tank. The upper recovery hose attaches to the radiator. The bottom rubber hose attaches to the intake and heater hose coolant fittings. And if you have a low coolant light on the dash panel then you'll have a coolant level sensor mounted in the lower part of the coolant reservoir. Before we disconnect the hoses and remove the 10 mm retaining bolts we have to get the air induction system out of the way. The air inlet housing attaches to the throttle body via a large hose clamp and is held down to the plenum with a rubber grommet. This simply slides over a retaining post. They make the air inlet assembly large, because it includes baffles and airflow resonators that help quiet and smooth out the air as it flows into the Chevrolet throttle body assembly. On some models you do not have to remove the air filter box. However, I recommend that you remove it in all situations because it provides a lot of work area when removed. In addition, there are no bolts to remove from the air filter housing as this component also mounts with rubber grommets over retaining studs. After disconnecting the Chevy mass air flow sensor you can rock and then roll the plastic housing out of the way. Don't forget to check and or clean the easy to forget air filter element. Some people might say that you don't actually have to remove any of the plastic air intake systems to replace the Chevrolet radiator surge tank. Although this is true for some models it is not true on all. In addition, if your Chevy truck has more than 100,000 miles removing these giant plastic parts allows you a good visual inspection of the coolant hoses and engine compartment area. This will provide an excellent view of the Chevrolet intake manifold that is also a common coolant leaking area on the Chevy trucks. If you're interested to see what the procedure looks like you can watch others replace the Chevy coolant recovery tank. You can also review the procedure for burping the air out of the cooling system once the repairs are completed. Hint: burping the air out of the Chevy truck cooling system is not as hard as some of the other GM models. After refilling the system you run the engine until the thermostat opens and then you allow it to cool off completely. After the engine reaches ambient temperature it's time for the final topping off of the engine coolant. People often wonder why this part didn't last longer. They changed the style of the recovery tank late in the 2003 model year. I'm sure thinner and lighter seemed like a good idea at the time. The old tanks featured clear plastic, but the new style has a black plastic lid bonded on top of the tank. This top seam can develop pressure leaks. Nevertheless, the coolant recovery bottle itself mounts to a stable area of the automobile. The largest hose connection to the recovery tank connects to the engine heater hose system through a plastic T fitting that can also sometimes leak. The important part about this connection is the engine is constantly moving. As the bottle remains steady the engine moves. If fact, it jumps around quite a bit since they mounted it heavy duty rubber engine mounts. Therefore, the lower coolant reservoir hose constantly moves and vibrates. As the plastic ages this vibration takes its toll and starts to create hairline cracks. With the new design launched in 2003, the thinner plastic doesn't hold up. Well not as long as the thicker plastic on previous generation Chevrolet trucks. For more information about common automotive problems visit the homepage for the fix my old ride website. We stuck this Chevrolet radiator surge tank article in the tune-up and maintenance problems category.